Ladakh is a mountainous region of the state of Jammu and Kashmir of India and it is located beyond the Himalaya. 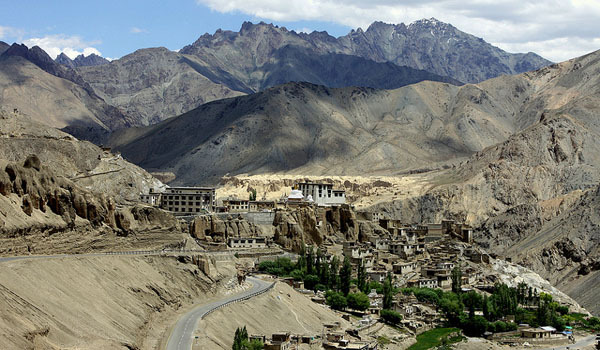 The beauty of Ladakh cannot be expressed in words as it is called as the “Roof of the World”. The incredible mountains decorated by sparkling snow, and running gleaming streams and waterfalls makes this place look like a world of fairy tale. You can also see rocky topographies with spectacular sceneries and lush green forests which has its own story to say. You will be left fascinated by the serene Buddhist history and cultures of this area with many beautiful palaces, monasteries, Gompas, and religious shrines. Ladakh is a place where you will not only visit the Buddhist monuments and Gompas but also to explore dynamic natural beauty from its various regions. But you can actually visit its capital city Leh where you can see the exquisite natural valleys with snowcapped mountains and some of the most visited attractions of this area which includes Shanti Stupa, War Museum, Leh Palace, Stok Palace, Hemis Monastery, and Chamba Temple. You cannot afford to miss the Zanskar which is a sub district of Kargil and located near Zanskar River. You can definitely find the Doda, and the Pensi –La Mountain pas which is magnetically beautiful with dense lush green forests and shiny and flowy waterfalls and streams. Do not miss the Karyag River as this is an area which is a hub for the trekking lover and you can also see some snow leopard and Tibetan Wolf. You also have to visit Ladakh if you want to explore the beauty of the Nubra Valley known as the ‘valley of flowers’ which is easily accessed by motor bikes. If you are a nature lover and love to capture in your camera then do not miss this place for some high head mountains, ruined Buddhist gompas, apple orchards and white sparkling waterfalls. Nature lovers could also visit Drass valley, Suru valley and Spiti valley. Do go for trekking and camping in the Leh-Karu-Chang La-Tangtse-Pangong Tso where you can enjoy exotic natural beauty and amazing views of the Himalayas. Fulfill your dream of trekking on the Kand Yatse trekking valley as every trekker has it in their hearts. Do visit in the months of June and July to attend the various festivals of Ladakh which you can enjoy the most as they are held every 12 years, and importantly at Hemis Gompa and at that time the monastery will showcases its greatest treasure, such as a huge thangka and many other things. If you want to get away from the worldly chaos then do spend some quality time in the monasteries of Ladakh meditating in them and in these places you can also get some exclusive courses on meditation and retreats for peace of mind. Have some staple Tibetan and Ladakh food in this place which comprises of thukpa a noodle soup, pasta called skyu and many cakes and pies. Help us to improve this article/list "Ladakh". We would be glad if you can comment below and provide your valuable suggestions and feedback. If this page about Ladakh have any wrong information/list or out of context content, then you can report us as well.